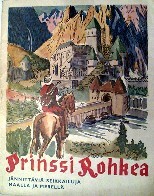 Our hero is called Prinssi Rohkea by this oldest publisher from Finland. They did print at least 1 book in 1948. Uusi Suomi was a newspaper from Finland between 1847 and 1991. The probably had our hero in the newspaper and decided to print an album out of it. This book is very rare, price estimation between 250 and 400 euros (estimation 2006), cover artist not known.